Movies and books like “The Secret” want you to believe that the Law of Attraction is something new to everyone. But the truth is the Law of Attraction has been known since biblical times. 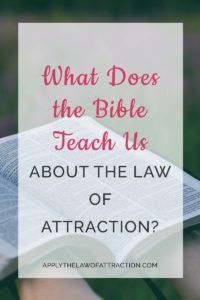 In fact, the Bible not only provides clear instructions on how to use the Law of Attraction…it also shows instances when the Law of Attraction is in action. One of the most basic principles in the Bible is “with God, all things are possible.” The Law of Attraction is centered in God. Yet, the Biblical perspective on the Law of Attraction is left out by many teachers of the Law of Attraction. God has a plan, a purpose and a reason for every single person on this planet. God wants you to attain your dreams and goals. When you do that, you bring glory and honor to His name. That’s why the Bible teaches the Law of Attraction within its pages. Did you know the Bible has over 200 verses related to the Law of Attraction? So why isn’t the Law of Attraction taught in churches? Some churches and religious centers do teach the Law of Attraction. But you have to pay close attention because they will use different words to convey the same ideas that you will find when you study the Law of Attraction. For example, God can be used to mean your imagination, while Lord can mean Law. As you go through this website and read the pages about the Law of Attraction and the Bible, you will learn about these different words, and the ways that the Law of Attraction is taught in churches. You will also discover specific examples in the Bible when the Law of Attraction is clearly being used. Such as the book of Genesis where you’ll find Joseph holding the belief of becoming a great leader so strongly in his mind that it came to be. No matter the obstacles he faced, he didn’t lose faith. I’ve never written about the Bible without citing examples. Please take the time to read the entire article. There are examples in it. Also, if you follow the links to other articles, you’ll find more examples. Its amazing to realize that The Law of attraction is actually exactly what the Bible teaches, I am a Bible believer and when I came across the teachings of the Law of Attraction it immediately clicked in my mind, wow this is exactly what God wants us to know in order to be the best we can be in this world. I challenge all Christians forget what other people say about their gods, this is the ultimate way of approaching the Teachings of Christ and rely Totally on the empowerment of Christ and His Spirit in our lives. Hi there, I thought I would share my thought with you, if you care to. I believe that God created us as His children, perfectly imperfect. Sure, the guidelines suggested by those who teach the law of attraction enable an understanding of how to get what we want. God loves us all regardless of merit or virtue, thus we are all able to get what we want in the lives He gave us. But without Him and what He taught us in the Bible, how can we find any meaning in it all? I’d rather know about God than the law of attraction but I believe that with both I can have everything I want AND give meaning and purpose to my life, through worshipping God.